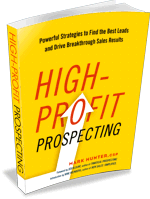 Are Your Leads No Better Than Lottery Tickets? What does the top of your sales funnel look like? More importantly, how does the top look like compared to the bottom? It’s time to get real. It’s the bottom of the funnel where we make our money. I know what you’re going to say, “You can’t get anything out of the bottom until you put something in the top.” Agree, but just what are you putting in the top? In my consulting work, I talk to a lot sales managers and many are proud to show me their sales process. They like to brag about the number of touch points and the methodology they’ve created to turn a lead into a customer. It all looks great on a chart, but when I challenge them as to their ability to follow through, I’m typically met with an excuse. The excuse I hear always centers around a lack of time. I’ll challenge the issue is not a lack of time, but rather what is going into the top of the funnel. What is the % of your leads you close and how much time and cost does it take to close one? When I start digging into the cost of sales spent on converting leads to customers, I’ll argue the money might be better spent on lottery tickets. Ok, maybe lottery tickets might be a little harsh, so hey let’s just play roulette instead. Don’t sit there and say how this situation can’t possibly be your situation. I’ll say it is for one simple reason — all of us in sales are far too optimistic about what we can achieve. I know I am, but hey, that’s what we salespeople do. We’re optimistic and always chasing the positive outcome. Once again, it looks great as a motivational quote plastered on a picture of somebody scaling a cliff. Last I looked, I’m not scaling a cliff and I doubt you are either. You see our challenge is to be working to segment our leads better by understanding better who our ideal customer is and then taking that profile to allow us to screen leads better. The best way for me to be able to improve my closing ratio is by having more time to spend with better prospects. To achieve this I need to stop spending time with leads that are no better than a lottery ticket.